As a school, we put a great emphasis on high expectations and valuing the success of all our students. To this end, all our students are encouraged to collect Achievement Awards (AAs) issued by staff for excellent work, effort or contribution to the school community. Students receive a raffle ticket for every 10 AAs they earn in Years 7-9 and every 5 AAs that they earn in Years 10-11. Each raffle ticket is entered into a half-termly draw for prizes. AAs also accumulate leading to Bronze, Silver, Gold or Platinum Achievement Awards. There are also numerous opportunities for students to earn rewards individually or as part of their tutor group, throughout the year. Celebrating success is important to us and we recognise achievement in a number of ways including colours for commitment to a range of activities such as sports teams, choirs, orchestras, dance, drama, student librarians and so on. There is much celebration of success by tutors through assemblies and the recognition of achievement, e.g. badges for tutor representatives or involvement in Student Voice, school teams, choir, etc. Unfortunately, we do know that students occasionally get things wrong. Here, a clear distinction is made between minor and more serious or repeated offences, reflected in our Ladder of Consequences (see below). All coats should be removed before tutor time or lesson and bags placed on the floor. All books, pencils, logbooks etc. should be on the desk ready to start the lesson. Lateness could lead to a note in the logbook or students receiving a detention. No student should pack up or put on coat until told to do so by a member of staff. Chewing gum is not allowed in school and if any student brings gum into school they will receive an automatic C5 detention (see next page). 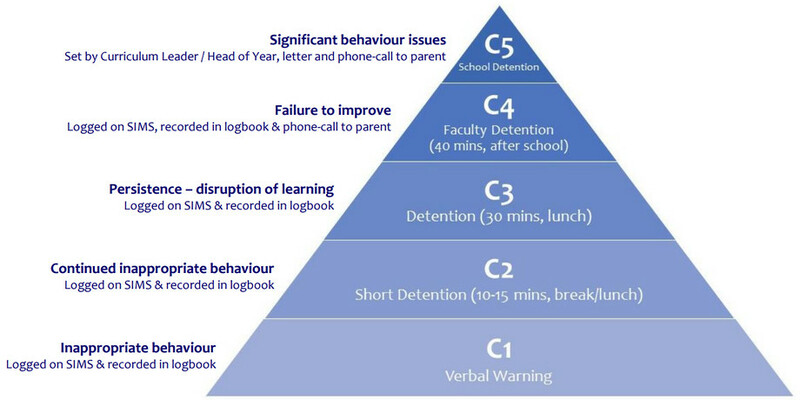 We operate a Ladder of Consequences for inappropriate behaviour (C1 is the lowest consequence and C5 is the highest). Please note that parents do not have the right to withdraw a child’s attendance at a detention, although we will try to be helpful if there are specific personal difficulties. Mobile phones, MP3 players and other mobile devices are not permitted in school and will be confiscated if seen. Students always use the litter and recycling bins appropriately. Every effort will be made to keep parents informed and the very best way to do this is by checking the logbook regularly. The school is exceptionally fortunate to be able to offer support to both students and parents where necessary but students and parents need to be clear that we will not accept behaviour which affects the learning of others. Smoking, being caught with smokers or chewing gum will result in a C5 detention. We attempt to use sanctions as a way of encouraging good behaviour and reflection on the poor decision-making that led to the sanction. For this reason, we will use community service within the school as a means of sanctioning graffiti or vandalism etc. On occasions we will isolate students from individual lessons if their behaviour has become disruptive to the learning of other students. There are, of course, rare occasions where incidents will require a sanction outside of the Ladder of Consequences. Persistent disruption or defiance, abusive behaviour, bullying, violence, vandalism, smoking or drug-taking (or being caught with students participating in these activities) could lead to serious disciplinary action being taken by the Headteacher, including fixed-term or permanent exclusions. On these occasions, the Headteacher will act in accordance with such policies as are made available to guide him by the Governors and the Local Education Authority. If the Headteacher decides it is necessary to exclude a student, attempts will be made by a senior member of staff to contact parents by telephone prior to a formal letter being issued. Most exclusions involve a build-up to the exclusion, during which consultation between home and school has taken place. Parents will be informed of how to appeal against the decision in the actual letter of exclusion. Our profound wish is that these measures will not be necessary and that students will adopt a positive and industrious attitude.